So here we are once again in the midst of the holiday movie season with plenty of family fun and enchantment to choose from: The Muppets make a comeback; Happy Feet II or is it III? 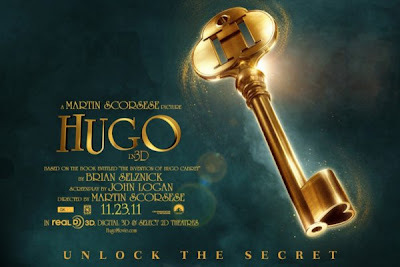 ; For the tweens and teens, another addition to the Twilight Saga, and for adults wanting to take their children to something magical with a message - Martin Scorsese's Hugo, based on Brian Selznick award winning book The Invention of Hugo Cabret. The film is set circa 1930's, although Hugo (Asa Butterfield) looks like a street urchin straight out of a Dickens novel. He's an orphan whose wonderfully loving father, a clockmaker (Jude Law) dies mysteriously in a fire. Hugo's uncle takes him to live in the walls of a busy Paris train station; teaches him how to keep the station clocks running; then disappears. Hugo, afraid of being sent to an orphanage, must be careful not to draw attention to himself, least anyone, particularly the ever vigilant station guard (Sacha Baron Cohen), find out he has no guardian. Clocks and time hold some significance for the film/book, but you'll have to draw your own meaning to this metaphor. 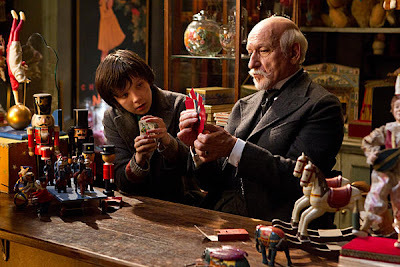 Hugo's adventure begins when he encounters the owner (Ben Kingsley) of a small toy booth in the train station and his precocious daughter, Isabelle, (Chloë Grace Moretz) which intertwines with a cryptic drawing, a treasured notebook, a stolen key and an automaton (mechanical man). What's missing from my synopsis, and more importantly, what drew Scorsese to this work of fiction, was the non-fiction element involving early filmmaker, Georges Méliès who made movies from the 1890s through the 1920s. He created the world’s first science fiction movie called A Trip to the Moon, which looks kinda trippy and strange. Both the film Hugo and the book The Invention of Hugo Cabret celebrate the life of this early film pioneer and magician, involving a large portion of the plot. In addition, the movie is obviously a love letter from Scorsese to the film industry in general; all the while teaching, encouraging and reminding the viewer of the importance of film preservation and restoration. In fact, Hugo will probably act as a lucrative funding tool for Scorsese's The Film Foundation. I have not seen the book, but I understand it's almost like a graphic novel. Brian Selznick's large, colorful illustrations creating an integral part of the magic of the story. 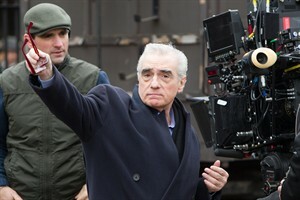 Scorsese brings these pictures to life using 3D technology; giving the movie a pop-up picture book effect. It was shot using 3D Arri Alexa cameras with Cooke 5/i lenses on Cameron/Pace mirror rigs. (Not that that means anything to me, but thought it might be an interesting tidbit to add, for those in the know). For my taste, I like a bit more fantasy, magic and supernatural elements, like in Harry Potter or Chronicles of Narnia. Still, I feel Hugo will be a timeless treasure discovered after the frenzy of holiday franchise movies finish dominating the box office. Hugo screening took place at The Franklin Institute's IMAX theater, courtesy of Philadelphia Film Society's Sneak Preview Series.